Balls’n’All have all types of games from original stand up cabinets to brand new sit down cabinets. Driving games, shooting games, single or multi game machines. 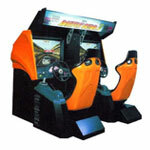 We can supply you with any cabinet with your choice of game or games. The Virtual Cop 2 provides head spinning, palm sweating action that will knock your socks off! – If you have the skill!! This action-packed, 3D shooting adventure games explodes with rapid fire action, fantastic new characters and high speed car chases. This game is more challenging than the original and features longer stages and tougher enemies to fight. 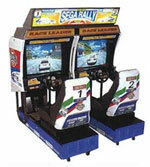 This is by far and away one of the best rally arcade games available. Race your friends on 3 different courses – the desert, forest or mountain. If your driving skills are up to scratch, you can progress to the lakeside track. This is a thrilling arcade game to play as you slide your car around the corners and fly at high speed over jumps. Daytona USA is a high-speed stock car racing game that allows you to select from four different and dynamic viewpoints to get a true racing perspective. Realistic stock car control allows drifting, controlled braking and even four-wheel drifts! 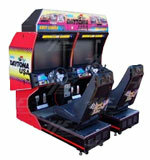 Stay on track with your driving skills by getting one of these arcade games machines from Balls ‘n’ all today. Battle Gear 3 is a racing game, pure and simple. You choose a car from any of the 6 main Japanese manufacturers; Toyota, Honda, Nissan, Mitsubishi, Mazda or Subaru. The cars are placed in class categories D,C,B,A and S and are real car models. You can view the specs of each car (Such as dimensions, weight, engine size etc) before racing your chosen car on any of the 6 challenging courses offered by the game. 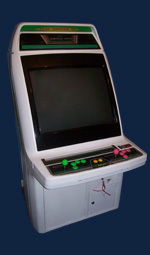 The two player Astro City has a huge 29 inch screen with high quality graphics and sound to provide unparralelled gaming excitement. Battle City, Blaster, Bubbles, Defender, Do Run Run, Gradius, Ghost’n Goblins, Ice Climbe, Joust, Kick Rider, Mario Bros, New Rally X, Robotron, Sky Kid, Solomon’s Key, Splat, Rally X, Stargate, Super Mario Bros – All your favourites in one box! 1942, 1943, 1943 Kai, Arkanoid, Amidar, Bomb Jack, Burger Time, Centipede, Congo Bongo, Crush Roller, Dig Dug, Dig Dug 2, Donkey Kong, Donkey Kong Jr, Donkey Kong 3, Frogger, Galaga, Galaga 3, Galaxian, Gun Smoke, Gyruss, Hustler, Jr Pacman, Jumping Jack, Juno Frist, King Balloon, Ladybug, Mappy, Millipede, Moon Cresta, Mr Do, Mr Do’s Castle, Ms Pacman, New Rally X, Pacman Plus, Pengo, Phoenix, Pleiads, Pooyan, Scramble, Shao-Lin’s Road, Space Invaders, Space Panic, Super Breakout, Super Cobra, Super Pacman, Pacman, Pinball Action, Quix, Tank Battalion, The End, Time Pilot, Van-Van Car, Xevious, Zaxxon. Here at Balls ‘n’ All we never tire of the classics, and were so excited when this old favourite was revived. 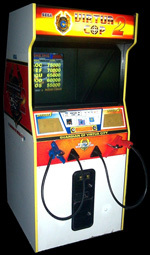 1942, 1943, Amidar, Arkanoid, Bomb Jack, Burger Time, Centipede, Crush Roller, Dig Dug, Dig Dug 2, Donkey Kong, Donkey Kong 3, Donkey Kong Jnr, Frogger, Galaga, Galaga 3, Galaxian, Gyruss, Hustler, Jnr Pacman, Juno First, King and Balloon, Ladybug, Mappy, Millipede, Moon Cresta, Mr Do, Mr Dos Castle, New Rally X, Pacman, Ms Pacman, Pacman Plus, Pengo, Phoenix, Pinball Action, Qix, Scramble, Shoa-Lins Road, Space Invaders, Space Panic, Super Breakout, Super Cobra, Super Pacman, Tank Battalion, Time Pilot, Van-Van Car, Xevious, Zaxxon, Pooyan, Pleiads, Gun Smoke, The End, 1943 Kai, Congo Bongo, Jumping Jack. Hours of fun for the whole family is only a phone call away – contact Balls ‘n’ All today to find out how you can get your own cocktail table games machine. Another old favourite has been revived, and are excited about it! 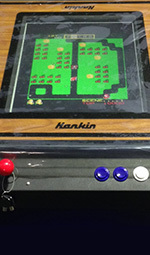 This classic 2 player table top contains a total of 60 games which include 1942, 1943, Amidar, Arkanoid, Bomb Jack, Burger Time, Centipede, Crush Roller, Dig Dug, Dig Dug 2, Donkey Kong, Donkey Kong 3, Donkey Kong Jnr, Frogger, Galaga, Galaga 3, Galaxian, Gyruss, Hustler, Jnr Pacman, Juno First, King and Balloon, Ladybug, Mappy, Millipede, Moon Cresta, Mr Do, Mr Dos Castle, New Rally X, Pacman, Ms Pacman, Pacman Plus, Pengo, Phoenix, Pinball Action, Qix, Scramble, Shoa-Lins Road, Space Invaders, Space Panic, Super Breakout, Super Cobra, Super Pacman, Tank Battalion, Time Pilot, Van-Van Car, Xevious, Zaxxon, Pooyan, Pleiads, Gun Smoke, The End, 1943 Kai, Congo Bongo, Jumping Jack, Second – Galaga, Pacman, Ms Pacman, Jr Pacman, Pacman Plus. The Second games are all set on the hardest setting.Supplied with two stools. Hours of fun for the whole family. And if that was not enough, this monumentally exciting table-top arcade game also comes with an additonal 1200 games! Contact Balls ‘n’ All Today to find out how to get this amazing piece of gaming equipment for yourself.